When a gunman opened fire in a UCLA professor's office in a murder-suicide Wednesday, another professor outside the office held the door shut. 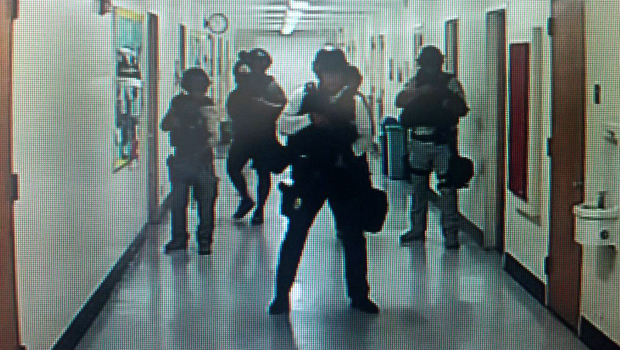 Police confirm UCLA shooter had a "kill list"
In an interview published in the Los Angeles Times Saturday, Christopher Lynch confirmed that he held William Klug's office door shut after Mainak Sarkar shot his gun twice. "If he had stepped out, we'd all be in trouble," Lynch told the newspaper. Lynch said he didn't feel Sarkar try to open the door, but he was confident that the gunman heard warnings in the hallway for people to evacuate. "If he had come out with a loaded gun, I don't think I'd be alive," engineering professor Ajit Mal told the newspaper. "Chris Lynch's presence of mind and quick action saved us." Lynch said he assumed the gunman killed himself when he heard a third shot. He gave the key to the door when police arrived, and he didn't look inside Klug's office.